This week's project is a wet formed coin pouch. Wet forming leather can be a lot of fun so I've been looking around the house for things that would make for a good mold. I have a number of Altoid tins, so I used a small one to make little coin pouches. I think I'll try the larger tins at some point as well. More pictures of the finished pouches at the end of this post! My parents are traveling to Japan, which was our home for over a decade. This is their first time back in 17 years, so these two pouches are for them. They'll need them to store all the coins for the ubiquitous Japanese vending machines, right? Then I remembered I have these things called clamps. The third time, I placed one piece of leather cut to the curve of the tin under the clamps, grain side to grain side for the least amount of marking. 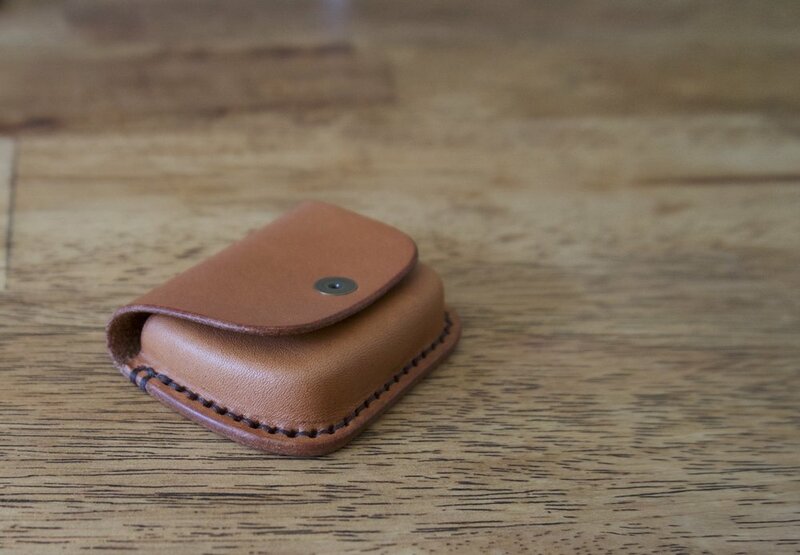 I formed the first pouch directly over the tin only to come back a few hours later to discover small dark spots on the surface of the leather. At first I thought it was possibly mold or something similar, but after some research I found that the tannins in leather can react with iron. I used plastic wrap over the tin for the other pouches, and other than one or two spots it fixed the problem. Lemon juice, being an acid, can also help reduce these spots. Someday I'll get one of those fancy sets that allows you to stamp full words at once instead of one letter at a time. I usually like to keep my workbench open and cleared off as I'm working, but it ends up like this during random projects. 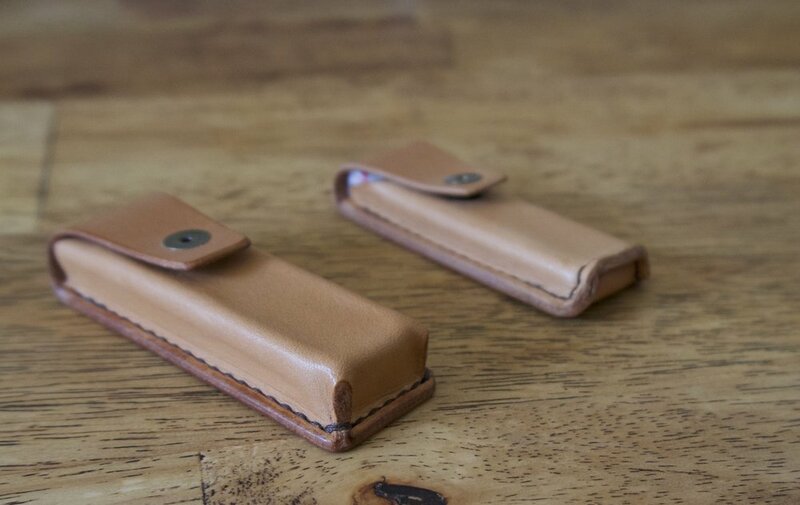 The completed pouches. 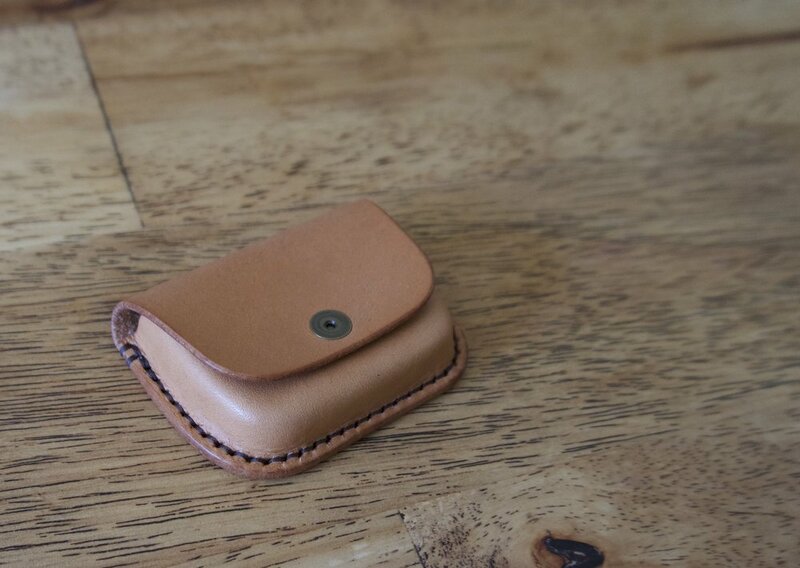 The last three images show the rough prototype pouch. 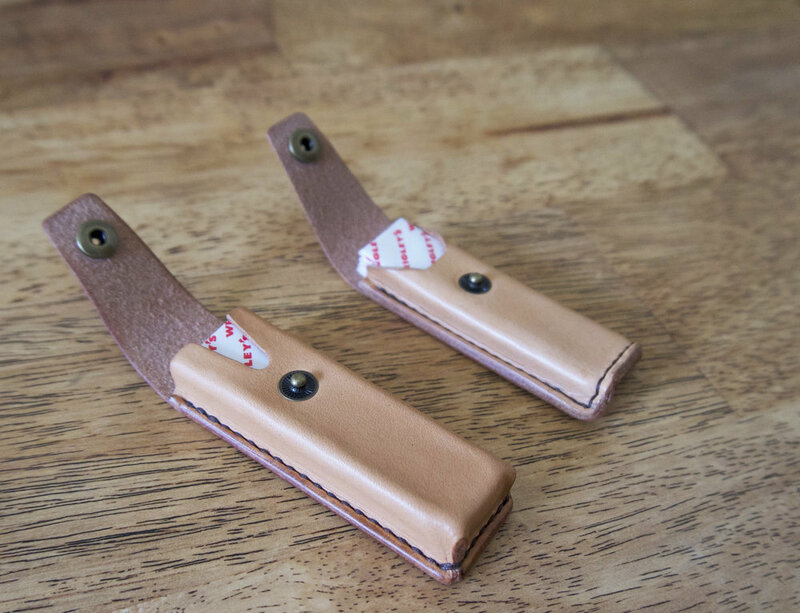 I'm trying to get back in the habit of working on these small leather projects. It gets me out of my routine and exploring new techniques. Along the way maybe I'll hit on something that would make a good product, but mostly I just want to make things I would personally use. The problem is I get bogged down by wanting to figure everything out before starting a project and have it be perfect the first time. Predictably, I never get started. So I'm forcing myself to create a sort of rough draft piece that allows me to think out loud and then create a revised piece that improves upon the first. I realize when I type it out like that it sounds like an obvious process, but sometimes one needs simple reminders to get out of a mental rut! Most of the photos below show the revised version, but you can see both in a few of the last pictures. So, the gum pouch. Joe loves his Wrigley's Doublemint gum, and has been asking me to create a pouch that could hold 4-6 sticks of gum at a time. He just had a birthday so that was the perfect time to finally make it. I've wanted to try more wet moulded projects, so I decided to go for a simple wet formed box shape stitched to a flat back piece. A few photos of the building process. Making wooden molds or something similar isn't very practical in my current space, so you'll see a lot of finagling with the wet forming. I'm sure there are better ways of doing this, but my challenge is to just make something already and not overthink it (and then do nothing). In this case I found that an eraser was mostly the right size, so I worked the vegtan leather into the right shape and clamped it down until dry. Once dry, I punched the stitching holes and stitched it to the back piece, and trimmed the edges and corners as I went. Then the flap was cut to size and finally edges were burnished. That's it! Maybe later this year I'll make an update post on how it's aging. With summer coming up it should quickly tan to a nice golden brown.